Have you been featured on Hawaii Wedding Style's website or magazine? Be sure to grab yourself a badge and link back to us. 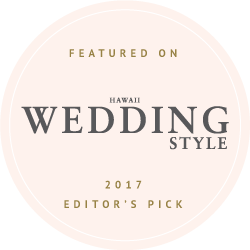 We love sharing local weddings, engagement sessions, and inspiration shoots from the talented wedding vendors located in the state of Hawaii.